Over the last five years, more than 480 new species of plants and animals have been discovered in Singapore by the National Parks Board (NParks), researchers and naturalists. And almost 150 of those are world firsts. The agency also said yesterday that almost 20 species of plants and animals had been rediscovered here over the last five years. NParks has also put the afterburners on its Species Recovery Programme, increasing the number of species to 94, up from 46 last year. Other than that, the largest biodiversity survey by the public and plans for a new park connector in Thomson were two other causes for celebration at this year's Festival of Biodiversity organised by the agency. The two-day festival, launched at Nex shopping mall in Serangoon yesterday by Minister for Culture, Community and Youth Grace Fu, includes free art-and-craft workshops, a nature-inspired art exhibition, talks by local conservationists and guided walks in nature reserves around Singapore. It is a collaboration between NParks and some 30 partners - including universities, schools and non-governmental organisations - to encourage appreciation of Singapore's natural heritage. The festival is also the culmination of a week of activities organised by NParks, among which was a nationwide wildlife survey that involved nearly 3,000 members of the public at 84 sites. Despite decades of biodiversity surveys - all the way back to the great naturalist Alfred Russel Wallace in the 19th century - new species are still being found. More than 500 animal and plant species were discovered or rediscovered in Singapore over the last five years, the National Parks Board (NParks) revealed yesterday at its annual Festival of Biodiversity. One of them, a solitary carpenter bee, has been given the name "sayang", meaning "love" in Malay, on account of a heart-shaped marking on its back. Ceratina sayang, which lives alone in holes bored in wood, was found in a bloom of giant orchids in Dairy Farm Nature Park in 2014. At Bukit Timah Nature Reserve last year, an NParks staff stumbled upon an orchid, Acriopsis ridleyi, that had not been seen since 1889. Not taking any chances, the agency took it for propagation at the National Orchid Garden nursery. One of the latest discoveries was made during a survey at Sisters' Islands Marine Park last week, when National University of Singapore Assistant Professor Huang Danwei discovered the coral Favites vasta in Singapore for the first time. He was guiding members of the public taking part in one of the nationwide surveys, or BioBlitzes, by NParks. Other discoveries include a tree that had been standing in the former Warren Golf & Country Club for years but was identified only in 2012 during the construction of NUS' University Town, and a secretive snake that leads a muddy existence in Nee Soon Swamp Forest. Both are new records for Singapore. NParks said some of these species may play crucial but hidden roles in maintaining Singapore's natural habitats, and has taken measures to enhance their populations or protect their habitats. Number of species in NParks' Species Recovery Programme. It recorded almost 900 species of plants and animals from both land and sea, including a coral species new to Singapore. Previous public surveys only involved one site at a time and far fewer participants, said NParks. To ensure that species have access to suitable habitat, NParks undertakes projects to enhance natural areas around Singapore. For example, the agency announced yesterday that one lane of Old Upper Thomson Road would be converted into a park connector by early 2019. Seeing the animals for themselves in the forest, gets to them. And they realise they can actually do something about it. They get inspired when they see young people like us who are doing our bit. MS CHLOE TAN, 28, who organises nature walks, public library roadshows and school talks for the Love Our MacRitchie Forest movement, an independent group of nature lovers. 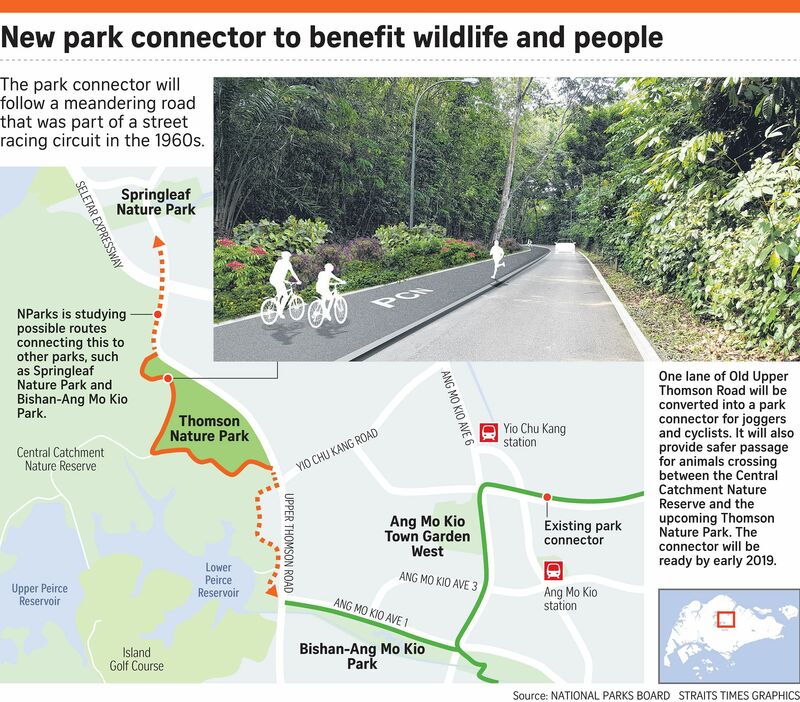 The road runs between the Central Catchment Nature Reserve and a patch of forest that will become Thomson Nature Park, and will become a one-way drive. NParks said this would create a more conducive environment for both wildlife and park users. Mr Desmond Lee, Minister in the Prime Minister's Office and Second Minister for Home Affairs and National Development, who attended the event, said: "While we marvel at our rich biodiversity, we cannot take it for granted. Conservation requires a long-term effort." He added that as Singapore's conservation efforts bear fruit, there would be more human-wildlife encounters, and highlighted the importance of educating the public and developing new ways to manage human-wildlife issues. Independent wildlife consultant Subaraj Rajathurai, 53, was heartened by the predominance of young leaders and volunteers taking on such roles. "We need youngsters to speak out, because it's their future," he said. One of the participants is Ms Chloe Tan, 28, who organises nature walks, public library roadshows and school talks for the Love Our MacRitchie Forest movement, an independent group of nature lovers. She signed up when one of her tutors at the National University of Singapore needed someone to help set up the group's website. She said many of the young volunteers are life sciences students, but there are also those who join nature walks and get converted. "Seeing the animals for themselves in the forest, gets to them. And they realise they can actually do something about it. They get inspired when they see young people like us who are doing our bit," said Ms Tan.